Michael "PUNKY" Koch: Do we really grow up? Do we really grow up? I have been a slacker with blogging. I have a few pictures from over the past month but will start to get better with taking them. As I look in the mirror every day I swear I get older looking ever day but no matter how much older looking I get I think I am still a kid inside and I think we are all still kids inside but we just need to let it out a little more. As kids we love dressing up and can get away with wearing pretty much whatever. We can dress up like a sheep and no one questions what we are doing but just laughs. 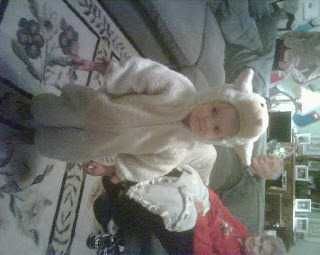 My niece Clara was the sheep for our nativity scene during Christmas and she looked so cute in her outfit. 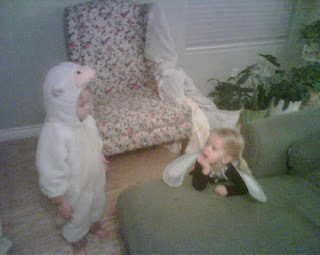 .....and when that sheep meets an angel with angel wings no one blinks an eye, but just thinks its cute and laughs. This picture cracks me up because they are looking at eachother like...What are you wearing? The littlest things are fun to us when we are kids and obviously still to me as an adult....even playing swords with your Uncle Michael, when the swords are actually empty wrapping paper rolls. I tried to get Charlie to walk around with it to keep Molly away but that dog is just a little too crazy. We like to do funny little poses and think we are cute. 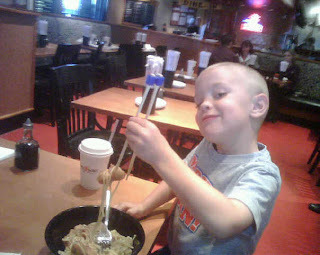 Benji finally figured out how to use the chopsticks and he was pretty stoked about it. Smart little kid. But as adults we still do the same sorts of things. People may think we are a little wierder but it is just the kid trying to come out. 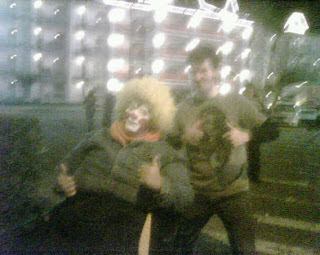 Yes I saw this guy and had to get a picture with him because its not every day you see an overweight black clown in an electric scooter, but it was AWESOME!! 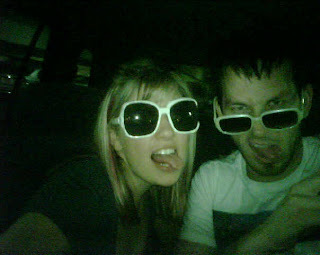 I still wear funny glasses and make funny faces like I am a kid. I buy 1 new pair for funny glasses every road trip and my friends always wear them when we hang out and yes all 4 of these glasses are mine sadly. 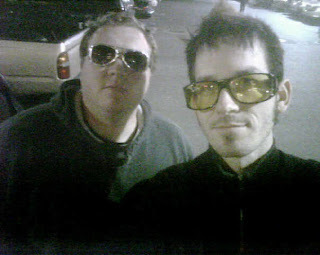 Yes....I have a lot of funny looking glasses that I loan to my friends when we hang out...haha The ones on the right are thanks to Dad. and best of all I still love the Ice Cream man!!! I was playing Ping Pong with my buddies and I heard a familiar sound so I ran out of the house and there he was!!! THE ICE CREAM MAN!!! I got some cheddar fries which I find are impossible to find and some sour skittles but man have the prices gone up. I paid like 1$ for the skittles and 50cents for the cheddar fries... Well I promise I will be better at taking more pictures. Until next time!! Did you run to mom and dad's house first to raid the change bowl before buying from the ice cream man? Those were the days. Tom and I always talk about how funny it would be if adults did some of the things kids did. Like how they run then fall flat on their faces then get right back up like nothing happened. Michael, you are writing the best posts these days. I love reading your blog. You're a great writer...you have a way of expressing yourself and I can hear your voice saying these things, too. I think you'll always have that kid side of yourself and that's one of the many things I love about you--your enthusiasm for life and all it has to offer. I really do think you're growing up, but just don't ever let that fun side of you die. Your kids are going to be so lucky to have a dad like you. 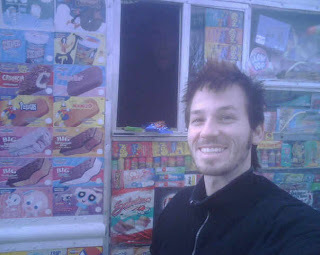 The last time I heard the ice cream truck I was visiting family in California a little over 2 yrs ago. Do you want to know what we bought with our own money? $5 worth of those snap toys, $2 worth of fart bombs and ice cream of course.... It was nice being able to buy what you want without begging your parents for cash. 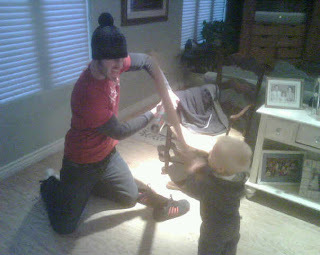 Wish my kiddies were around to play with their Uncle Mikey! Miss you!